The LaunchPad profiling system brings together ten powerful diagnostic instruments to deliver unmatched insight into your people and their potential. Each instrument offers a distinct framework for understanding human behaviour, preference and ability. People are complex, but you need to know they can get the job done. Unlike other profiling systems, LaunchPad utilises this multiplicity of perspectives by looking for the points of connection and conflict to identify behavioural factors that no single instrument or non-integrated assessment battery could detect. The result of this is a picture of the individual as they really are – how they are likely to fit with the needs of your organisation, the situations where they are likely to struggle or thrive, and advice on how to help them unlock their true potential. 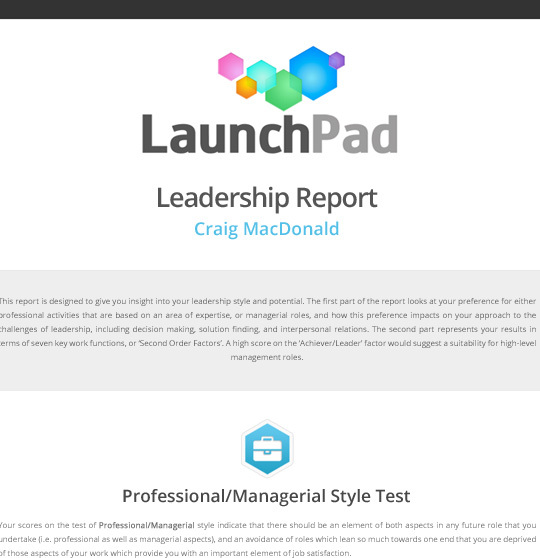 With its powerful graphics, expert reports, and analytical functions designed to help you make sure that your people, departments and teams are aligned with corporate strategy at every level, LaunchPad makes the links so that you can make the most of your people. Integrate LaunchPad into your HR processes to build an organisation and develop talent that will be flexible, resilient, innovative and informed in the face of change. Building on over twenty years of research, these reports draw out hidden patterns from the battery of assessments to deliver practical, situation-based insights into the individual, their behaviour and abilities. Topics include motivational drivers, circumstances where the individual is likely to work effectively or have difficulties, team-working style and how the person handles conflict, high-level thinking and decision-making skills, leadership potential and style. 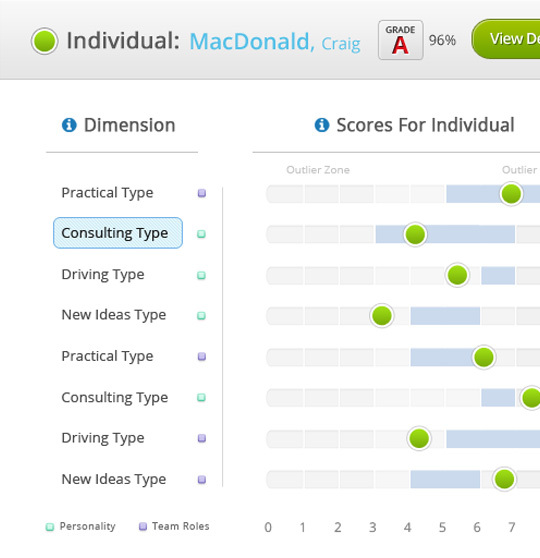 LaunchPad provides a suite of tools allowing you to identify the needs of the role, and rank your people against them. Instantly identify gaps between the candidate and the specification to generate tailored recommendations for proactive development. Use LaunchPad’s validated dimensions to build realistic profiles utilising your knowledge of the role, or profile a top performer and create a template to find and develop your next rising star. Build a library of key qualities vital to your organisation, then instantly grade multiple personnel to see how they match up. 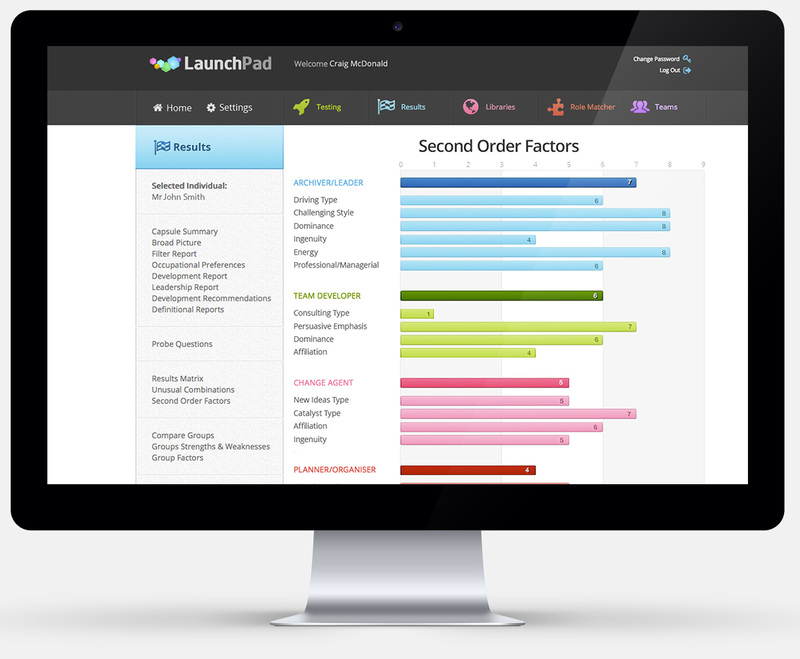 Explore an individual’s results across thirty-eight dimensions, or view the data in terms of seven key work-critical functions using LaunchPad’s powerful Second Order Factors. 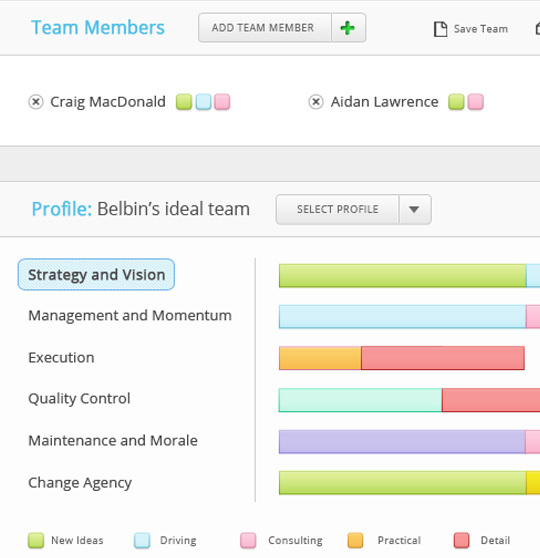 Instantly evaluate the dynamic functioning of your team with the Team Analysis view, or build a customised team profile to find the best people for a specialised project. Use LaunchPad’s Group functionality to compare high and low performing departments; find the secrets of success for a winning team then use LaunchPad’s advanced selection to put together another top team. "Quite simply, this is the best business system for developing our human resources." © Copyright 2015 Percept Resource Management. All rights reserved.